A wise person once said that a room without a view leaves no room for imagination. And we think he is right. No matter where we are traveling to, we make sure to get rooms with epic views, and flights or trains with window seats. So, why settle when traveling with bae too? Budget to luxury, we bring you a list of hotels (with views) that'll woo bae and you. Old world charm, classic chandeliers, interminable corridors, cosy yet chic rooms are just a few things that define The Glasshouse. Located above Rishikesh, this heritage property by Neemrana Hotels is right out of a picture book from the 1960s. The property is on a riverbed, so expect yourself waking up to the sound of rustling leaves and gushing river. The rooms and the balconies open to the flowing river. They have three types of rooms and the price ranges from INR 8,000-13,000, and it includes breakfast as well. So, if you're looking for a special way to surprise bae, this might just be it. Have your 'Into the Wild' moment with this treehouse that is located inside the Bandhavgarh National Park. These luxury tree houses have a jungle view and we're loving those canopy beds. While bae and you can snuggle inside the treehouse and take some eye-candy pictures for Instagram, we urge you to go on a tiger safari or take a walk in the park to spot rare species of birds and animals. It's an adventure that'll bring you both closer, for sure. They have two types of rooms, and they cost anywhere between INR 21,000-35,000 (double occupancy) depending on your plan. It is not every day you wake up to the view of the Taj Mahal. The Gateway Hotel in Agra is a beautiful property that comes with the view of the Taj from a few of its rooms. And these spectacular rooms come under a budget of INR 3,500-4,999 per night, depending on your choice. While the Superior Double Room comes with a Taj view, we recommend you check with the hotel before you book. The Zostel at Udaipur is arguably the most stunning of their properties. It is located bang opposite to Swaroop Sagar Lake and this lake-view stay comes alive in the night with the roof entirely lit up. While we can vouch for the quality of the rooms and the rich conversations with strangers at Zostel, but if you're looking for some privacy, the deluxe private room gives you a slice of royalty. This room too opens to the view of the lake and is priced at INR 1,678 per night. I mean, what a deal! Wouldn't you just love a sea view chalet? Even more so, if it's Andaman. Think of a white sand beach, large pools, towering palm trees, and wake up to the lovely sound of waves crashing against each other. The resort also offers you plenty of activities that include Scuba Diving. So, if bae and you are looking for a perfect monsoon escape and sunrises that put the word beauty to shame, you've got to check this one. Apart from the chalet (villa), they have more stay options too, and the price ranges between INR 7,500-15,000. This bungalow is straight out of a Ruskin Bond book and literature lovers will find a certain joy in staying here. A colonial style bungalow that is nestled amongst deodar trees gives you a sedate view of the hills and Bhimtal Valley. Frolick around in the jungle and watch the rare butterflies and animals. Relax at the lounge with a vast book collection or dine on Kumaoni delicacies — either way, your stay is sorted. They have two types of rooms and the price ranges between INR 5,500-6,500 per night. Located near Dindi, in West Godavari, Palavelli is an escape you'd kill for. 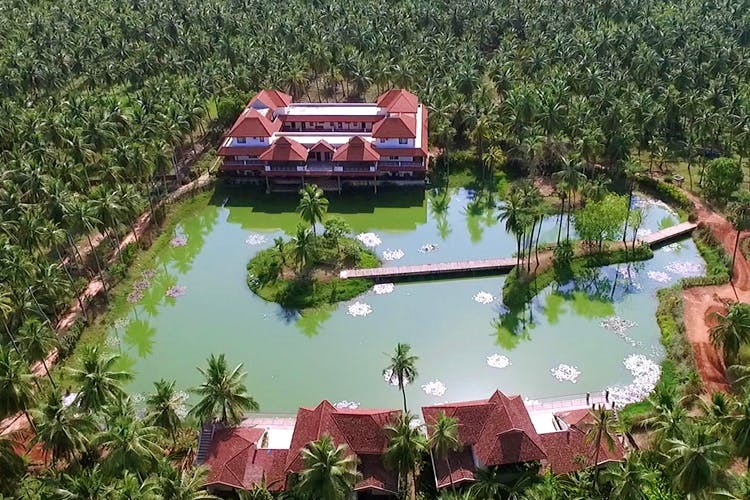 The resort is quite literally located amidst coconut trees and till a faraway distance, that's all you will spot. Explore the backwaters in the houseboats or pick a rustic stay like their Earth Villa. Plenty of stay options are available at a price of INR 4,500-6,500. All the rooms are designed differently but share the same view.